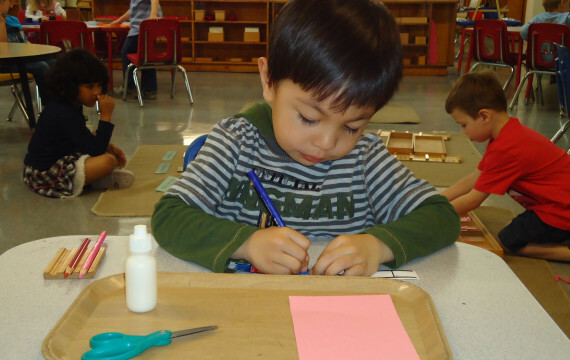 While a Montessori program is too extensive to give a brief treatment to every area, the following offers a brief introduction to our school’s program. 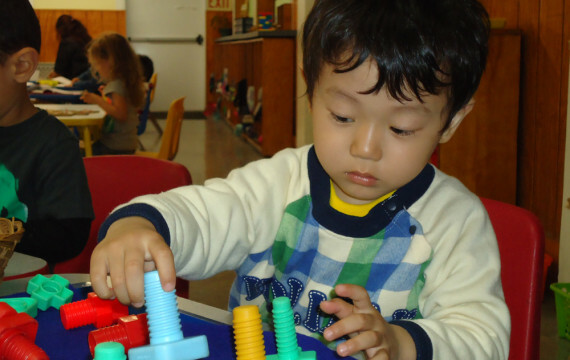 For more detailed information, it is recommended that you visit a Montessori classroom. The child is attracted to those things that give him independence and control of his own life. A most important activity of the young child is to develop his muscles and coordinate his movement. 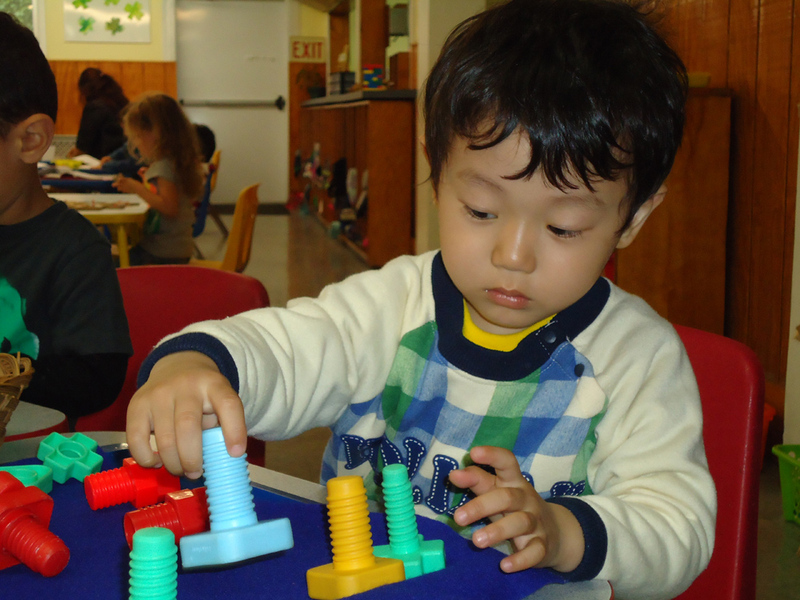 This development enables him to focus his mind on a particular activity, i.e. to concentrate, therefore, to approach future tasks with greater proficiency. Special materials enable him to learn to tie his shoes, button, and use many other fastening devices. 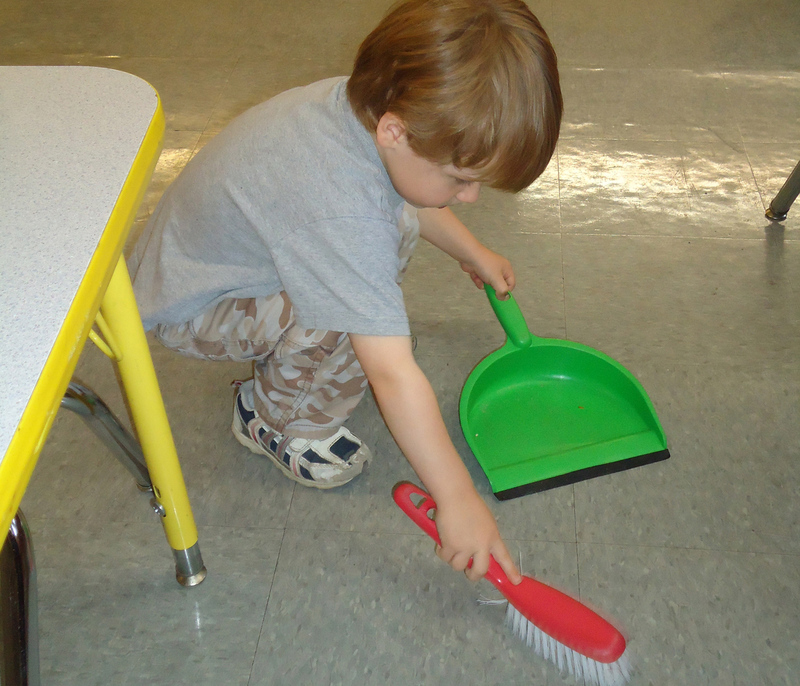 With materials scaled to his size, the child enjoys sweeping, dusting, washing, polishing and gardening. Lessons on courtesy permit him to deal with everyday situations. The basis of the child’s interest is that these activities are real and exist in his every day life. It provides the very foundation on which the child approaches all other work. Among the interests of the child from age three to six are experiences that involve his senses in his exploration of his environment. The child is able to exercise, discriminate, and learn the vocabulary which corresponds to his sensorial experiences. These tools of life afford the child the ability to form his frame of reference with which he can classify those inputs to his senses and allow greater opportunity to be successful in all other fields. According to Dr. Montessori, the evolution of language begins with the infant’s unique capacity to absorb intact fragments of language, which will serve as a basis for his development. This continues through an orderly, unconscious process of assimilation and abstraction. This child first discovers that sounds have meaning, and then he isolates the parts of speech. Finally, he grasps the use of sentences. The constant assimilation of language results in a sudden expansion of vocabulary. The child learns the oral language naturally. He automatically takes it from his own environment. The work of the teacher is to expose his to the equivalent forms of written language which he learns through the same general pattern of development. 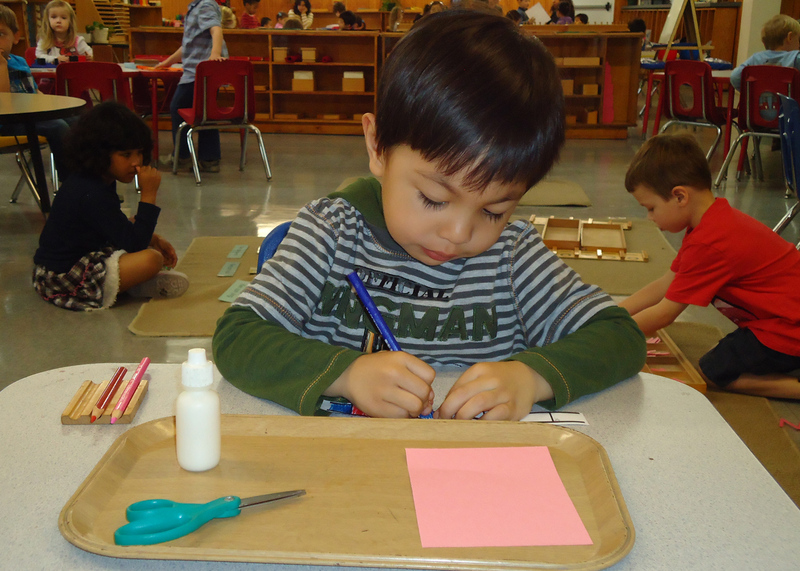 The Montessori child begins reading when he is ready and proceeds at his own pace. 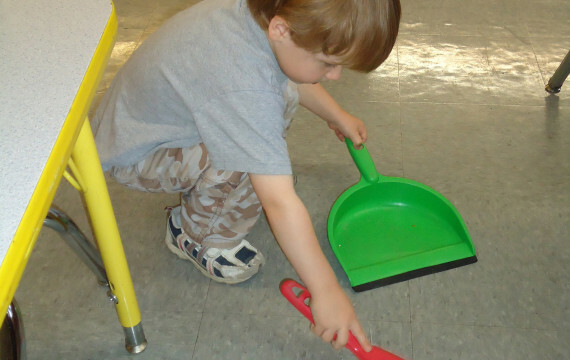 His experiences in practical life and sensorial education serve as a preparation for this. The sandpaper letters provide a phonetic basis for reading. This child’s desire and sensitivity to touch are utilized by these letters that are cut out of sandpaper and mounted for tracing. He not only hears the sound and sees the shape, but trains his muscles for when he begins writing. With cut-out letters the child builds his own words on a mat. The material frees him from the fatigue of his still developing writing skills, and yet gives him the opportunity to pursue his interests in words. This child builds his store of words through storytelling, conversation and many exercises in the environment. These activities serve as preparation for the time when the child assimilates what he knows and explodes into reading. Written language is clarified by illustrating the function of the parts of speech. When a child understands function, he has a concept that allows the definition to have meaning. Logical analysis of phrases, clauses, and sentences lead the child to a recognition of style in the works of literature. He perfects his reading ability through exercises in interpretive reading. The development of language is not limited to a single academic area. All subject matter is inter-related and organized around the child’s vital interests. The materials for mathematics introduce the concept of quantity and the symbols for quantity – the numbers 1 through 10. The quantity is introduced by a series of rods, which the child can count and compare. He matches sets of symbol cards with the rods. Using a variety of beads and symbol cards the child becomes familiar with the numbers as a decimal system including concrete experiences with the operations of additions, subtraction, multiplication and division. These exercises not only teach the child to calculate, but they provide a deep understanding of how numbers function. He learns concrete mathematical concepts and the materials lead him to the abstract, so that his understanding has substance. Because of the concrete nature of the materials, the child is able to work with the basics of factions and geometry. We use simple science experiences to introduce and illustrate the phenomenas that are observed in nature. For example, experiments dealing with evaporation and condensation lead to an understanding of the rain cycle. Other scientific experiments form the basis for the study of biology, botany, geography and geology as well as physics and chemistry. These sciences are not taught simply for their implicit value; they are taught to give the child knowledge and thereby respect for the life around him.